Utrecht, The Netherlands – Citing Prof. Jose Ma Sison’s role in conceiving, establishing and guiding the National Democratic Front of the Philippines (NDFP), Luis Jalandoni, chief international representative of the NDFP and chair of the NDFP peace panel, warmly welcomed comrades, guests, friends and compatriots at the launch of Prof. Sison’s latest book, Building People’s Power, at the NDF International Information Office last 10 April 2016. He related the role of Sison in founding and developing the National Democratic Front of the Philippines.Since its founding on April 24, 1973, the NDFP has grown to 18 allied revolutionary organizations: the CPP, the NPA, workers (2), peasant, women, youth, three indigenous people’s organizations (CPDF, Lumad, Moros), Christians, health workers, teachers, government employees, artists and writers, and the latest, Compatriots representing millions of overseas Filipinos. 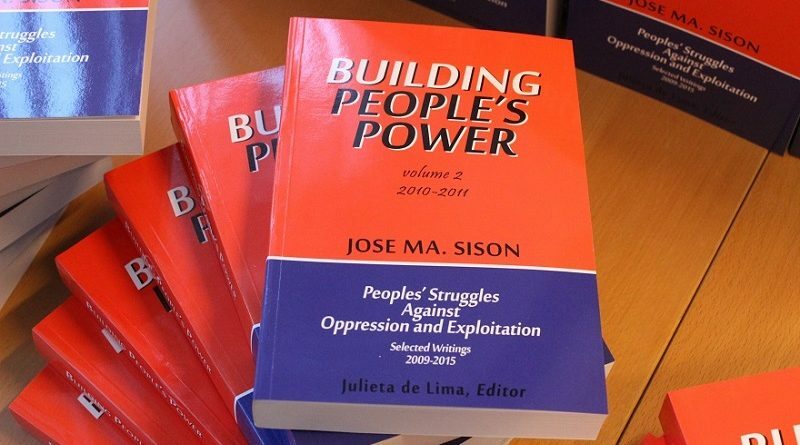 Building People’s Power is mainly a collection of Sison’s writings from July 2010 to December 2012. These take up historical and current Philippine issues as well as global issues and show the way to arouse, organize and mobilized the people in the anti-imperialist and democratic struggle. He wrote on Philippine issues mainly in his capacity as founding chairman of the Communist Party of the Philippines and chief political consultant of the NDFP and on global issues as the Chairperson of the International Coordinating Committee of the International League of Peoples’ Struggle (ILPS). The first reviewer, Malu Villañueva, a leading Filipina activist and professional from from Philippine migrant organizations Kabalikat and Pinay sa Holland, cited the dialectical relation between the Party that leads and the masses who must act to fulfill their historic mission… as the theme running through many articles in the book. She averred that even as the author congratulates the people for exercising and asserting their sovereign right and power to change society in the “Arab spring” that succeeded in toppling the repressive regimes in Tunisia and Egypt to the upsurge in mass protests in the US and Europe that produced the “Occupy Wall Street” and “Indignados”, he is acutely aware of the limits of what spontaneous movements can accomplish but at the same time keeps his revolutionary optimism and patience. Professor Gealogo said that “while the focus of the book is on the contemporary conditions, it is evident that all of the articles includes were historically grounded and contextualized.” The global contexts, Gealogo stated, were always present in all of the articles, with discussions on the conditions and issues confronting the socities and peopleś movements in Greece, Tunisia, Korea, Kurdistan, Indonesia, West Papua, Libya, Egypt, Germany, the Philippines, the UK and the region of North Africa and the Middle East as these societies confronted and challenged the forces of American imperialism and reaction. Overall, Professor Gealogo stressed, the essays elaborate the running theme of the book – that the people’s revolutionary movements all over the world developing within the context of the inability of imperialism and reaction to resolve the deeping global crisis will constitute the main historical driver in the transformation of periods to come. Malcolm Guy, the general secretary of the International League of People’s Struggle and much-awarded Canadian alternative film maker shared his thoughts on the book and on Joma: “It has been a wonderful learning experience. My time with Joma taught me that revolutionaries could be both profound, determined and occasionally very firm, yet still be engagingly funny and self deprecating. And that they could be enthusiastic, if not always totally coordinated, dancers, and energetic, even if often out of tune, singers. “I have sat in ILPS ICC meetings, and been awed by the depth and breadth of Joma’s analytical skills and his seemingly limitless knowledge of world economics, political movements and philosophy. The hardest part was often having the difficult task of asking Joma to wrap up his intervention since we had so many other points on the agenda we could not afford another 30 minutes on this single topic! “I am working on a documentary film on JMS and his revolutionary partner, Julie de Lima, the editor of the book that is being launched tonight….” He relates that as part of the filming for the documentary of Julie and Joma, last December 26, he attended an anniversary celebration attended by more than 5,000 in one mountainous guerrilla base of the Communist People of the Philippines, the party that the author of tonight’s book helped to set up back in 1968. “The NPA fighters put on an impressive show. I was struck that many of the fighters were women and that there was an impressive number of indigenous people, mostly Manobo, among the fighters. They were extremely smart, energetic and brave, and clear about their revolutionary goals, and ready to give their lives for that goal of freeing the people of the Philippines from reaction and imperialism. “And as I talked with them I realized that they all had studied at least one of Professor Sison’s other books, the famous Philippine Society and Revolution. “Once again I realized the power of Prof Sison’s writings. These were not theoretical treatises, but books written in the heat of the the revolutionary struggle, books with a purpose, books arising out of our practice, books to help guide the revolutionary struggle in the Philippines… and the world,” Malcolm concluded. In brief remarks, Professor Sison thanked the organizers, the NDF Information Office, the International network for Philippine Studies and ILPS-Netherlands for the book launch and for timing it with the end of the meeting of the International Coordinating Committee of the ILPS to allow ICC members to attend. Sison said the timing is appropriate because most of the content of the book consists of speeches and statements he wrote as chairperson of the ILPS in 2010 and 2011. “The title of the book lays the emphasis on building people’s power by arousing, organizing and mobilizing the masses. Indeed, quite a number of the contents directly deal with the building of the mass movement, including the legal mass struggles and the people’s war, and express support for major mass struggles as well as condemn imperialist plunder and war and state terrorism in various countries of the world,” Sison emphasized. The book launch was followed by a stirring cultural performance of a poem written by Mexican performance artist Inti Barrios Hernandez about the forced disappearance of 43 students who were abducted by armed authorities in Tamaulipas, Mexico. Inti Barrios Hernandez and Mitchy Saturay of Linangan Cultural Network led the dramatic performance and engaged the audience in the search for the disappeared. They co-recited the poem with Prof. Jose Maria Sison. Ms. Paloma Polo emceed the book launch from the beginning to the end. She is a well-known Spanish visual artist. She a co-founder of La Solidaridad Hispano-Filipina, the director of Project Unrest based in The Netherlands and is a member of the International Coordinating Committee of the International League of Peoples’ Struggle. ← Global Action Day to demand “Land, Food and, Justice” for the People!